It happened in 2007. Ten years ago the trajectory for electrical use in America peaked and started down a different course, declining for reasons we don’t fully understand yet. No, this wasn’t a one-time drop but a clear shift, moving in a new downward direction that continues to this day. There should have been celebrations and parades, even dancing in the streets, but no one noticed. In much the same way animals, not humans, are able to pick up on weak signals for an impending earthquake, our ability to sense an industry’s peak still mystifies us. To make matters even more complicated, it may not be the peak. Our emerging electric car and trucking industries coupled with plummeting battery prices, solar roofs, IoT devices, artificial intelligence, home battery packs, and energy efficient everything are just a few of the interrelated issues that will turn virtually every prediction about our future electrical needs into a low probability forecast before its even mentioned. 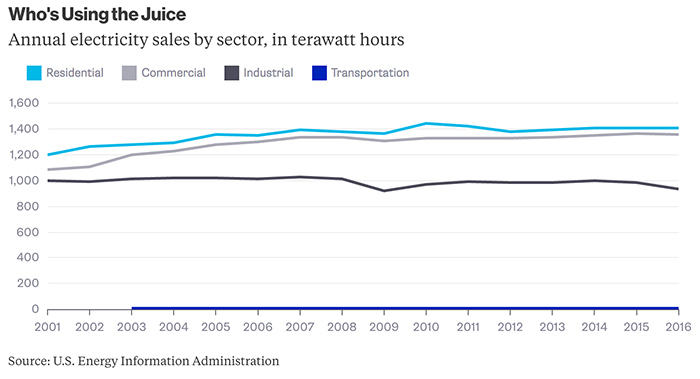 Have we reached peak electrical use in the U.S.? In 1989, Amory Lovins, Founder of the Rocky Mountain Institute, spotted a typo – “negawatt” instead of “megawatt” — in a Colorado Public Utilities Commission report and decided to start using “negawatt” as a theoretical unit of conserving power, representing the amount of electrical power saved. While the term never really caught on, Lovins’ goal of finding more efficient ways to use electricity had begun many years earlier. Art Rosenfeld, a senior staff member at Lawrence Berkeley National Laboratory known as the “godfather of energy efficiency,” launched a far-reaching campaign promoting energy conservation. As it turns out, the “nagging era” may have come to an end. We may have turned the corner when it comes to nagging at people to turn lights off. 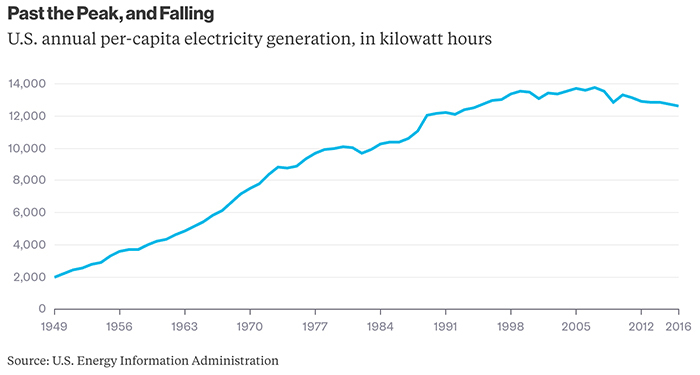 Per-capita electricity use has now fallen for six years in a row. We’re back to the levels of the mid-1990s, and it would appear we are headed even lower. 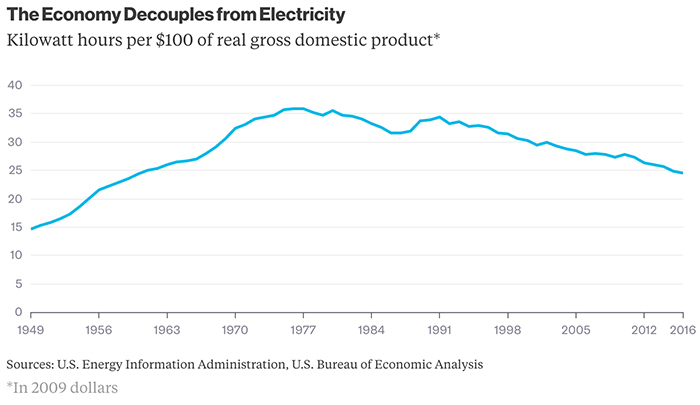 For a quick overview of the shifting landscape for electricity, here are seven important charts. 1.) The Electricity Plateau – The initial drop in electricity use in 2008 and 2009 could be attributed partly to the economic downturn. But the economy grew again in 2010, and every year since. Electricity use in the U.S., meanwhile, is still below its 2007 level, and seems to be flat lining. 2.) Past the Peak and Falling – Per-capita electricity use has fallen for six years in a row. We’re now back to the levels of the mid-1990s, and seemingly headed lower. 3.) The Economy Decouples from Electricity – Our digital economy is rapidly decoupling from the electric demands of the industrial era. State and federal efficiency standards for buildings and appliances have enabled us to get by with less electricity. Increased use of information and communications technologies have also allowed people to conduct business and communicate more efficiently. Higher prices for electricity in some areas have depressed its use. Structural changes in the economy have reduced demand. Electricity use is being underestimated because of the lack of reliable data on how much energy is being produced by rooftop solar panels. 4.) Who’s Using the Juice – We’re experiencing some significant structural changes to our economy. A good indicator is our shift to cloud computing. From 2000 to 2005, electricity use by data centers in the U.S. increased 90%. From 2005 to 2010, the gain was 24%. As of 2014, data centers accounted for 1.8% of U.S. electricity use, according to a 2016 Lawrence Berkeley study, but their electricity demand growth had slowed to a crawl. 5.) 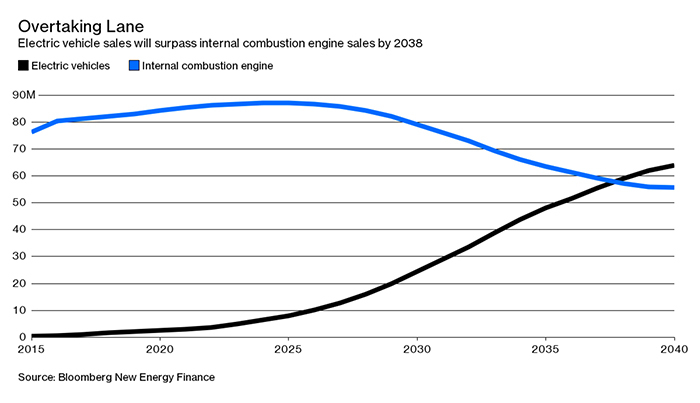 Overtaking Lane – According to Bloomberg researchers, in just eight years electric cars will be cheaper than gasoline vehicles, growing quickly to 530 million electric vehicles globally by 2040. Today there’s around 90 gigawatt hours of EV lithium-ion battery manufacturing capacity, and this will grow to 270 gigawatt hours by 2021. Charging infrastructure may also prove to be a significant bottleneck, potentially slowing growth in key Chinese, U.S. and European markets. 6.) 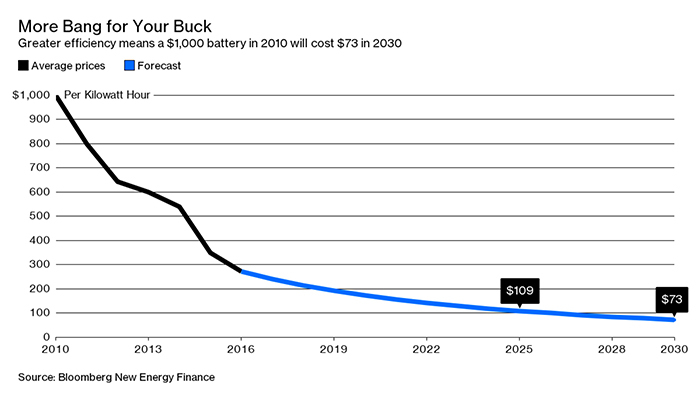 More Bang for Your Buck – Lithium-ion cell costs have already fallen by 73% since 2010 and Bloomberg New Energy Finance predicts battery innovation will accelerate and lead to an ongoing decline in prices over the next two decades. 7.) A Diminishing OPEC – The global shift toward electric vehicles will create an upheaval in the auto and oil industries, ranging from reduced gasoline demand for large oil companies to collapsing demand for manufacturers of spark plugs and fuel injectors whose products aren’t needed for plug-in cars. While many traditional car suppliers will be hurt by EV growth, some commodities will get a boost. The future of electricity can best be broken into four fundamental categories – power generation, power distribution, electric storage, and changes in demand. After looking at the charts above of some of today’s most important trends, it was easy to uncover a few emerging trends that analysts haven’t been considering. While some of these may only represent a miniscule probability over the next few years, the interplay between emerging technology and social acceptance, coupled with an exponential growth curve or two inserted into the mix, will make the energy industry a truly dicey market to predict over the next 2-3 decades. 1.) Solar shingles, solar roofs, and Powerwalls – Internal projections show Tesla scaling its roof installations to 1 million per year by 2022. That’s about 20% of all roof replacements in the U.S. and 5% globally. With solar shingles and whole-house batteries (Powerwalls) getting cheaper over time, this will be a fascinating “scaling-up industry” to watch over the next couple decades. 2.) 3D printed solar houses – Contour crafting is a large-scale form of 3D printing used in the construction industry. As the technology improves, contour crafting will not only print the structure, but also the wiring, plumbing, bathroom fixtures, kitchen cabinets, insulation and roofing. It’s only a matter of time before we will see solar cells printed into the roofs and sides of buildings as well. 3.) Space-based power stations – After Japan’s Fukushima disaster occurred in 2011, an in-depth review of possible options concluded their most viable long-term strategy would be to focus on spaced-based power systems. Japan now has a 25-year plan to build the world’s first 1-gigawatt power plant in space. 4.) Atmospheric energy harvesting – lightning – Capturing the energy of a lightning bolt has been achieved on a small scale in laboratories, but no one has been successful at scaling it up. It only takes one mistake so not a lot of people playing in this space. While still theoretical, many think it will soon be possible, and the ultimate cool job of the future will be to work on a lightning farm. 5.) Thorium-based nuclear power – When it comes to nuclear power, thorium offers several potential advantages over uranium. It’s more plentiful, superior fuel properties, and reduced amounts of nuclear waste. It also has far lower weaponization potential. With research and experimentation already happening in several countries, thorium power has massive potential. As example, India is projecting it can meet as much as 30% of its electrical demands through thorium by 2050. 7.) Home batteries replaced by drones – Once drones are equipped to fly to remote buildings, dock with their battery stations, and perform a fully automated 2-minute replacement, our need to live in a wire-connected world will quickly diminish. 8.) Artificial intelligence and smart utilities – While still in development, A.I. will soon be able to use predictive algorithms to balance grids, anticipate failures, detect hacks, and precisely route power to where it is needed most. These smart systems will soon calculate precise details of every user, analyze a location’s supply and demand behavior, and store or release energy as needed to keep the grid balanced. 9.) Large-scale energy storage – There are dozens of methods for storing energy on a large scale including everything from supercapacitors, to flywheels, liquid metal batteries, superconducting magnetic energy storage, grid-oriented batteries, and heat fusion. As battery prices continue to fall, utilities and policymakers are increasingly looking at storage as an alternative to traditional peaking generation. 10.) Explosion of micro-grids – The micro-grid advantage can best be summed up in their freedom to experiment with new forms of energy generation, distribution, and storage. With national grids posing a serious security risk, the proliferation of micro-grids is already underway. Energy derived from solar, tidal, and wind sources are constantly shifting along with time of day, moon phase, season, and random factors such as the weather. For this reason, large-scale energy storage is most likely to find a home on experimental micro-grids. 11.) Electric agriculture – Going beyond a farmer’s electric cars are everything from electric tractors, to electric trucks, combines, augers, swathers, bailers, sprayers, and robotic harvesters. The electric version of virtually every piece of ag equipment is already in the planning and development stages. 12.) Electric shipping industry – Cargo ships represent some of the most polluting vehicles on the planet. There will be huge pressure for them to reduce the amount of sludge they dump into the ocean and electric ships are far less disturbing to marine life. However, once electric ships are in use, recharging an entire cargo ship will be no small feat. 13.) Electric airline industry – The airline industry is also hugely polluting and will also be pressured to clean up its act. Since airplanes are very weight-sensitive, there will need to be a number of advancements in battery technology before this becomes feasible on a broad scale. 14.) Electric drone explosion – We’ve already seen massive growth in the drone markets, but over time, the transition from fossil-fuel engines to electric will have a profound affect on the electrical power needs of the emerging drone industry. We will see the first billion drones in the world sometime between 2030-2032. 15.) Surge in off-grid living – The recent surge in interest around sustainable homes, ecocapsules, backyard shedquarters, shipping container homes, and low-impact lifestyles are all driving us towards something that can best be described as “simpler living.” There will always be people who love surrounding themselves with the opulence of their own wealth, but the general trend is in the other direction. Simple, more manageable lives that give us the opportunity to experience life in a more symbiotic fashion. 16.) Disposable houses – 3D printed houses will open the door to low cost structures designed as temporary or disposable houses. In many situations we will move past the “collapsible and movable” to the “grindable and re-printable.” These types of structures will also be off-grid and self-reliant, paving the way towards nomadic lifestyles that leave tiny environmental footprints. 17.) Tube transportation – With an explosion of attention being directed towards tube transportation systems like Hyperloop and ET3, it now seems inevitable that tube transportation infrastructure will be constructed in virtually every country on the planet. This will quickly become the largest infrastructure project in all history, and our ability to manage the power demands for this new form of transportation will become a critical factor in its development. The power industry has already entered a state of disruption, but is ripe for much more. Today’s politics will be a distant memory 2-3 decades from now. The list above is merely a starting point for those wanting to research the possibilities ahead. In much of the world, electricity demand is still growing. 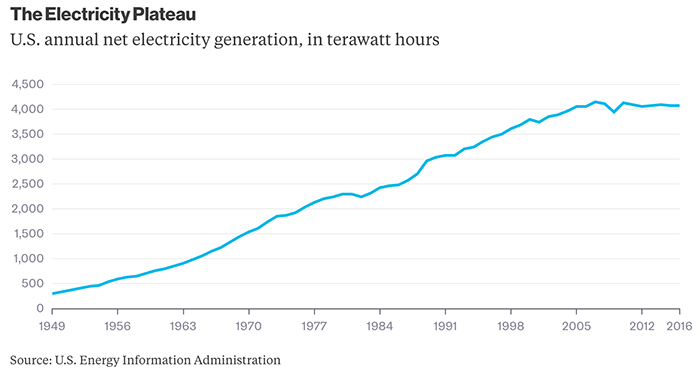 In China, per-capita electricity use has more than quadrupled since 1999. Still, most other developed countries have experienced a plateauing or decline in electricity use similar to that in the U.S. over the past decade. More than 80% of our energy today comes from burning fossil fuels, which is both harmful to our environment and unsustainable. At the same time, wind and solar have proven to be the lowest cost form of electric power generation across a majority of the U.S., even without subsidies. Renewables are already at grid parity and will continue to drop in price. Electric power will endure to be a battleground industry for decades to come. Our shifting base of technology, startups, lifestyles, culture, and politics will continue to make this a highly unpredictable landscape for the foreseeable future.